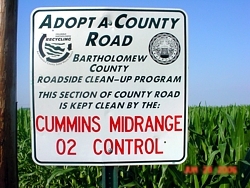 Adopt-a-County Road is a commitment to pick up roadside litter a 1-mile stretch of road located in Bartholomew County. Bartholomew County Solid Waste provides all materials required to complete a semi-annual clean-up and erects road signs on either end of the adopted road, and bag pick-up if necessary. Volunteers are recognized for their clean-up efforts via erected road signs and gain a sense of accomplishment by improving the environment and making Bartholomew County a more beautiful place to live. Please contact Kari Spurgeon, Education Coordinator by calling 812.376.2614 or email at kari.spurgeon@bartholomew.in.gov for more information regarding this program. © 2019 Bartholomew County Solid Waste Management District. All rights reserved.